These pages were designed by CTMH and are from the first Utah retreat I attended this year. I loved them and knew you all will too! The "hello sunshine" will be on Sept. 4 / 5 - the photo sizes are three 3 x 3 and two 4 x 6....I will show you that I used some flip flaps in mine but these are optional and not included in the class materials. Photos can be added later!! The second week will be a stamping challenge for you ! It will be Sept 25 / 26. The sides with the wavy colors are all hand stamped...The "Vegas" title is not included in the class in its place you all can get two extra photos - these photos are all 3 x 4 - again on my finished pages you'll see that I used flip flaps (again optional not included) but by using flip flaps I got 18 photos on my pages!! Buy Project Life for yourself! I love to take photos and then Scrapbook to keep those treasured memories in a safe place! Having classes and sharing the passion is an added bonus!! I use Project Life as my photo journal for the future - an amazing way to simply document everything. 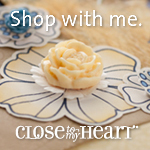 Click below to go to MY Close to My Heart Website!